The Auxiliary gift shops "pay it forward". Since 1955 the Auxiliary has donated over $11 million to the Health System. 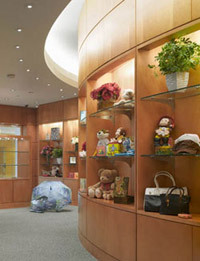 The Auxiliary Gift Shop is a valuable resource for patients, visitors, and staff. Our team is ready to assist you with a wide range of gift ideas and personal items. In addition to our catalog items, we stock clothing, jewelry, cards, holiday gift items, books, magazines, sugar free candy, snacks, and cold drinks. Place a phone order and take advantage of our free in-hospital delivery service to patients and staff. Please note hospital regulations may restrict deliveries to some departments like the ICU and the transplant units. The Auxiliary Gift Shop in the Peter Morton Building is a conveniently located near the parking garage. It's a place to grab a quick coffee, beverage, or snack on your way to and from the Medical Center. We also offer magazines, books, sundries, and gifts items. The Auxiliary Thrift Shop is one of the best kept secrets in town. We stock high quality new and used merchandise including men's and ladies designer clothing, jewelry, house wares, furniture, books, CDs, DVDs, small appliances, estate furniture, artwork and more.